I have been involved with supporting the technical side of various Yamaha UK Education events for a few years now, and every gig has been both interesting and enjoyable — not least because they have all involved working with extremely talented young performers across a range of musical styles. 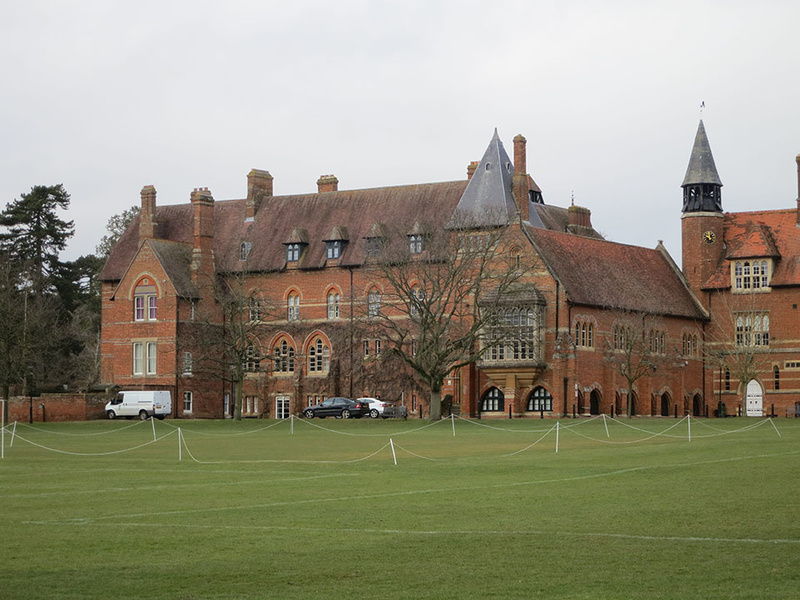 The concert took place at the newly refurbished Amey Theatre in Abingdon School.Having acted in a supporting role behind the stage at last year’s UK Junior Original Concert, I was asked to take charge of the sound for the 2018 show and, as the Abingdon School venue was a new one for this event, we made two advance visits to assist our tech planning and to try to ensure everything would go smoothly on the day. I met up with Yamaha Music Schools Education Manager, and the organiser of the event, Nigel Burrows at the venue, where we were shown around by members of the school’s technical team. 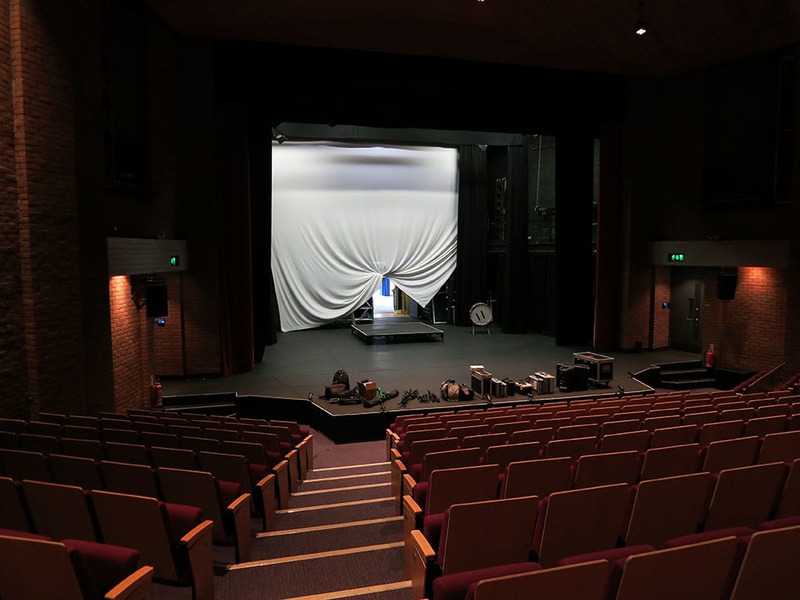 The Amey Theatre within the school’s Arts Centre is an impressive space, and has recently benefitted from an extensive refurbishment programme including upgraded seating, sound and lighting installations, and a new air handling system; the theatre even has a satellite link that is used to screen live-linked large-scale productions from other venues. 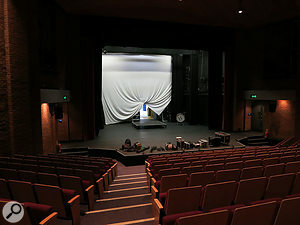 The venue, with stage set up and equipment loaded in.Sound practitioners and performers alike tend to develop an ‘instant ear’ for performance spaces, and this one was registering well into the ‘very good’ zone as soon as I went through the doors at the back of the auditorium. The 446 seats (including the balcony) are nicely raked and afford wide views of the stage from all parts of the audience area; the rake angle is enough to get a good view of the whole stage without needing climbing equipment to get up the slope, and as far as I could tell this applied right across the width of the theatre. The stage itself is solid and just the right height for good front-row viewing, and it can be configured to include a wide thrust section or opened up to reveal access to the orchestra pit below. Luckily, the venue offered excellent access via a ground-level door at the rear.Having looked around for a few minutes, and already starting to feel very comfortable in the space, I began thinking about the practical aspects, including where we would locate the sound desk, where the stage cables and tie lines would run, and what was the best access route for loading in and out. This last point was pretty important for this concert, as Yamaha were bringing in a full-size CFX grand piano on the day, and stairways or lifts would have been something of a problem. We needn’t have worried; at the rear of the stage, via a store/access area, was a large music room with multiple sets of nice wide double doors opening out directly onto the car park behind the theatre, so we had that most sought-after of get-in requirements: a direct, on-the-level route straight from truck to stage. 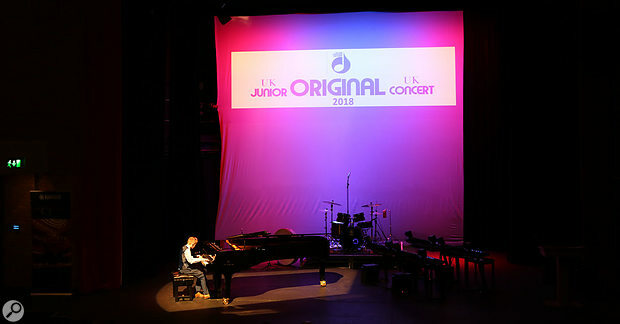 Having worked on these shows before, I was very aware that the overall sound requirement was all about achieving a natural-sounding balance, and being both acoustically and visually unobtrusive as far as possible, especially as these young performers would have written and rehearsed their piano pieces without using any amplification. The stage input list was fairly simple, as most of the performers would use only the piano, but with some pieces requiring additional instruments in the form of percussion and extra keyboard parts. During our first conversation about the sound, Nigel was very clear that the piano sound was paramount, but he also wanted something that would not intrude visually and preferably be completely out of sight from the audience, and I was asked to source whatever I needed (within budget) to achieve this. 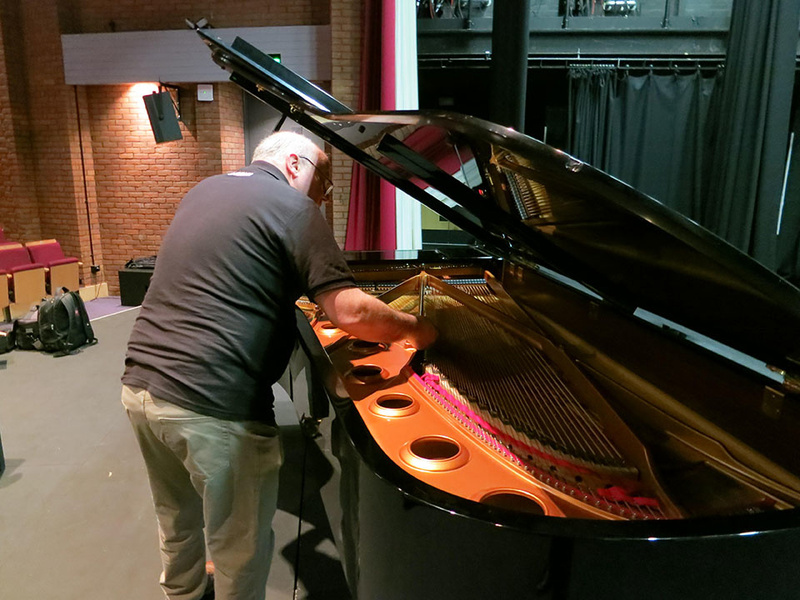 For the previous concert the sound engineer had hired in an extending bar that clamped across the piano, and thereby mounted two small condensers a little way ‘downstring’ of the dampers. 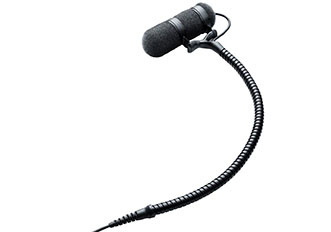 I did look into the availability and cost of a similar system including bespoke mics, but during a conversation with the SOS office the fact emerged that they were currently in possession of a set of mics that should be ideal for this job. The mics in question turned out to be DPA d:vote 4099 models, with specially designed mounts for use inside a piano, so it looked as if that particular box had been well and truly ticked. The rest of the input list was four ‘keyboards’ (the exact model to be revealed at a later date), two mics for ‘various percussion’, a drum kit and a compere mic at the lectern. There would be no vocals (normal for this concert), and monitoring would be minimal or possibly even not needed at all as the performances (and, therefore, the on-stage sound) were to be as natural as possible. The d:vote 4099 mics are interesting in that the same supercardioid pressure-gradient capsule is used as the heart of a range of specific variants (though there is a lower-sensitivity version for high SPL use, for example percussion and brass applications) with a number of different mounting options tailored for use on each family of instruments. The 4099B, for example, is supplied with a clip that sits below the bridge on the outer strings of a double bass, with fine adjustment provided by the flexible gooseneck; the 4099D is for drums, and so on. 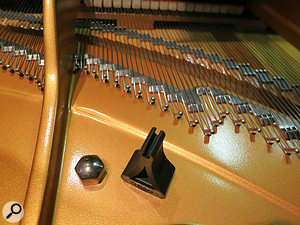 The piano version of the 4099 set comes with two magnetic clips that attach to the piano’s frame.All the microphones in the range (including this particular set for piano, known as the d:vote 4099P) are beautifully assembled, with the mic capsule housed in a small replaceable foam torpedo and mounted on a pair of very pliant circular bands — somewhat reminiscent of a tiny version of the thing a location sound person carries on a boom. The bottom of the gooseneck has a MicroDot connector to mate securely with the cable, and the gooseneck itself pushes tightly into a very solid rubber-covered magnetic mount and is locked in place with a captive clip. The point where you secure the gooseneck can be anywhere along its length, so the mic position can be adjusted quite a bit relative to the mount as well as being shaped to fit the application. Once the mic is clipped and locked to the mount it is extremely stable and only a deliberate and determined application of force is likely to unmount it. 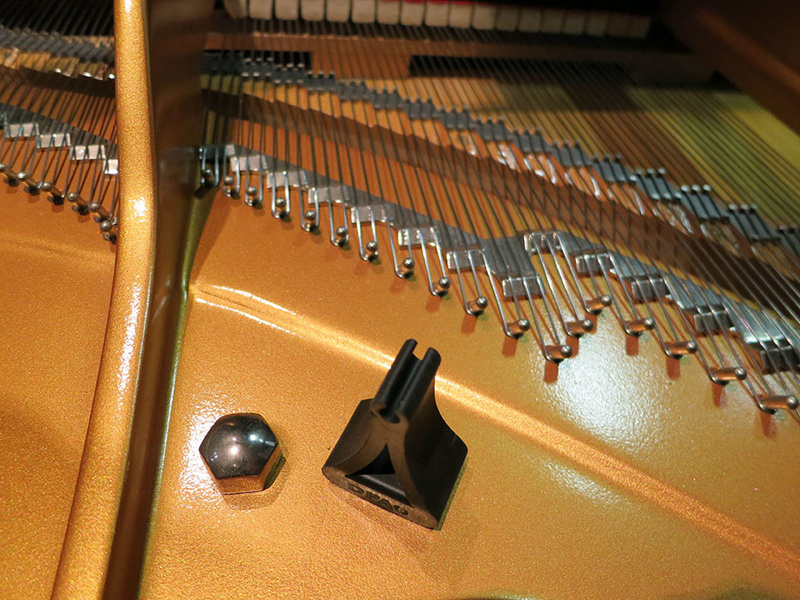 The same goes for the base clip as, in the case of this piano set, it contains a pretty powerful magnet that attaches itself enthusiastically to any nearby ferrous surface (for example, a grand piano frame) with a satisfactory ‘thunk’. The show was mixed on a Yamaha TF-3 console fed from two Tio 1608-D digital stageboxes.I decided to bring in a Yamaha TF3 desk with two Tio 1608-D stageboxes, and I arranged a further visit to the theatre to listen to the house system, which proved to be well set up and did a very capable job of reproducing several piano recordings we played through it at different levels. 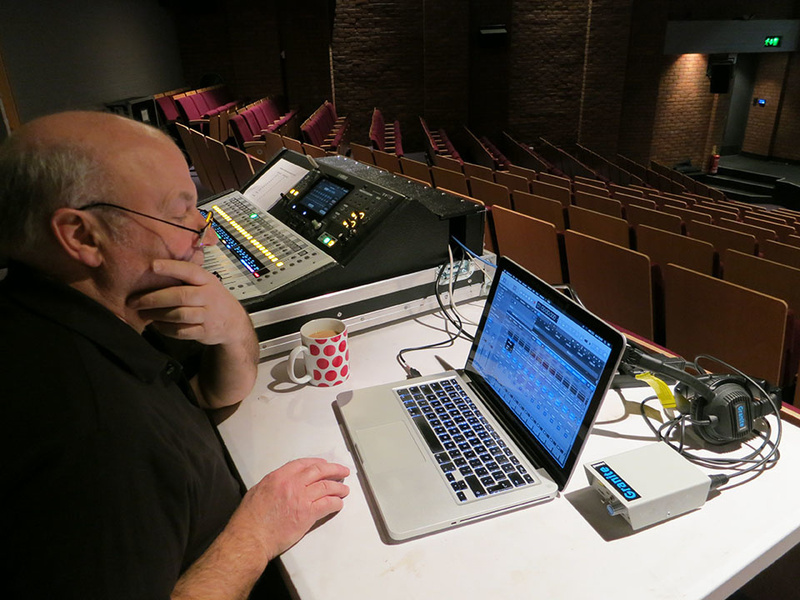 Having chosen to patch my desk into the house rig, I also asked if I could have a spot at the rear of the rake as my mix position, and the theatre staff happily agreed to remove a block of seats to accommodate this. The schedule for the day appeared to include plenty of time for setup, checking, rehearsing and tweaking, but there’s usually no such thing as spare time when it comes to live sound in an unfamiliar venue, and so I compiled my ‘best guess’ settings using the offline TF Editor software. Trying to keep stage cabling and mixer channels to a minimum, I planned on using the mono outputs from the electronic keyboards, and saved my starting scene on a USB stick ready to load up as soon as the desk was up and running. Get-in time on the day was 8:30am, and most of the early effort went into getting the desk installed, hooked up to the Cat 5 tie lines, and then patched into the house desk to feed the installed system. As the stage layout would be built around the grand piano we waited for the arrival of the beast itself. 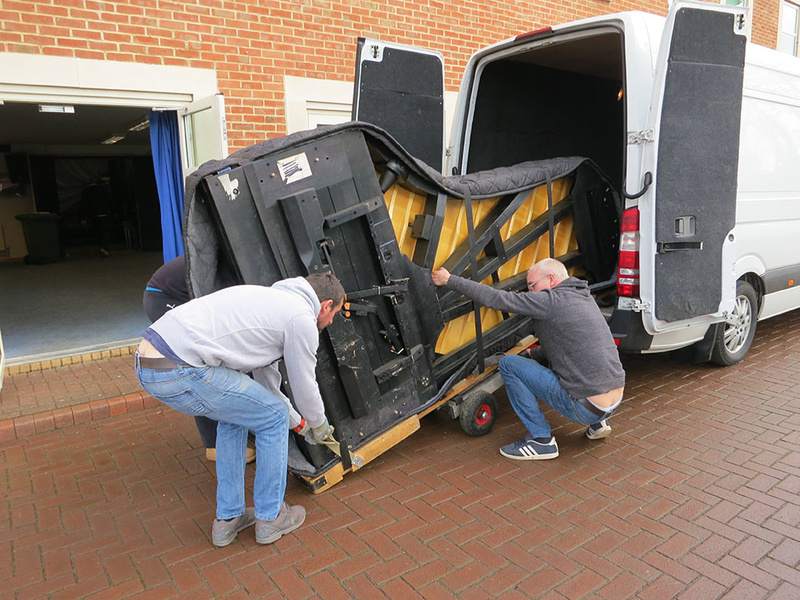 The specialist moving crew were shipping the CFX grand up from a festival in Hastings, and were also bringing in the four keyboards and drum kit. I had brought my own lectern mics but the theatre’s lectern had a mic already mounted in place, and they also had a dedicated, ready-optimised house channel, so the ‘we’ll use yours’ option was chosen to avoid re-inventing that particular wheel. 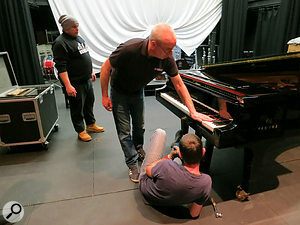 The piano tuner gets to work on the Yamaha CFX conert grand piano.I always find it fascinating to watch pianos being moved around, especially the large ones costing an awful lot of money and especially by a skilled, experienced crew used to handling a beautiful instrument with a comma in the middle of its price tag! Once the instrument was efficiently and safely out of the truck and in place on the stage we ran our cabling behind it, and then as others began installing the other instruments I started on the job of placing the DPA mics. I had a bit of time before the piano tuner was due to start work, so I was able to try out several different locations for the d:vote 4099 mics. The overall requirement was for the captured sound to gently reinforce but not detract from the sound of the instrument on stage (and we were expecting the theatre to be quite full, with a very engaged and knowledgeable audience who would know the performers and their music), but I also had to make a recording on my MacBook for later mixing and editing to support a live video soundtrack. The live sound quality was paramount, so I spent most of my time on that, as the recorded tracks could, if necessary, be worked on at a later date. Mike experiments with microphone positioning. When placing two mics fairly close to piano strings the exact position is something that will almost always require a degree of ‘try it and see’, and will depend on many factors including the stage construction, room acoustics, nature of the musical material, other instruments in the mix, and so on. The most basic choice for close-miking is to choose between placing the mics close together splayed outwards, and placing them apart to cover different parts of the whole instrument. I usually prefer to mic up live grands with the lid open, with good flat-response condensers a foot or two from the strings, but on this occasion the lid had to be either fully closed or on the short stick to avoid blocking sight lines across the stage (some of the performers being young children and of diminutive height), and for aesthetic reasons the microphones were required to be invisible to the audience. Suffice it to say that I tried quite a few configurations, and although nothing sounded especially ‘wrong’, I kept coming back to using a spaced pair, high/low placement, with the ‘right-hand’ mic about an octave and a half above middle C, and the ‘left-hand’ mic around C2-G2, about a third of the way down the strings below the dampers (ie. well into the piano casing). The DPA 4099 comes with a windsock, and is mounted in a small shockmount that sits at the end of a miniature gooseneck.Feeding the cables out of the piano was easy, as they are very thin but seem to be strong too — and these were carrying the weight of full-size XLR connectors, until I contrived a solution to take the strain off the cables without attaching anything sticky to that expensive, glossy black finish! DPA also supply a thicker cable for more physical stage work, but in this case the thin ones were kink-free and perfect for the job. Having someone play the instrument while I worked at the desk, I very gradually brought up the mics one at a time, making sure that the PA wasn’t changing the balance in either the upper or lower registers, and that the overall character and tone was as natural as possible with the PA in play. Apart from a little low-end roll-off (around 90Hz on the low mic and slightly higher on the right), I left the desk EQ perfectly flat — it just didn’t need anything more, and everyone present agreed that the piano sound was exactly what was wanted, in other words to sound exactly like itself, but a bit louder. When other instruments were introduced, particularly the heavier numbers with various synth voices in the mix, the only adjustment necessary was to lift the volume of the right-hand mic a little when the grand was playing a repeated, fairly percussive pattern, to put a bit of space between it and the other keyboard lines. One thing I have learnt from many gigs working with prominent acoustic instruments is that once I’ve arrived at a good, workable sound, it’s best to leave it alone for as long as possible before rushing in to change anything. Although the system responds instantly to turning knobs and altering EQ curves, I have become used to the fact that my ears do not, and I need a bit of acclimatisation time to integrate and appreciate all that I am hearing. So having achieved a very respectable piano sound from the DPA mics and a flat EQ, I waited until the piano had received its second tuning of the day and the rehearsals could begin. The story here is a short one — I didn’t do anything at all to the DPA mic channels, other than employ a very light touch on the levels. I did mute them once or twice, just as a comfort check, and everything sounded just, as fine as it had during setup. What I had feared most — a boxy or honky piano sound and associated blood pressure issues — just didn’t materialise, and I was able to concentrate on other things like miking up the promised ‘various percussion’ and four electronic keyboards all playing at the same time — you know the sort of thing. The biggest single live-sound challenge was, as you experienced sound people will have guessed, the compere’s lectern mic. The compere was reading from a script, but also turning around to welcome the performers to the stage, and I think a headworn solution may have been an easier choice in this department, but it’s often the unexpected and mundane things that you spend the least time on that then produce the most problems. Having said that, the concert was absolutely great, and we managed to tame the lectern mic with the help of a nice smooth bit of cutting around the 400Hz area. 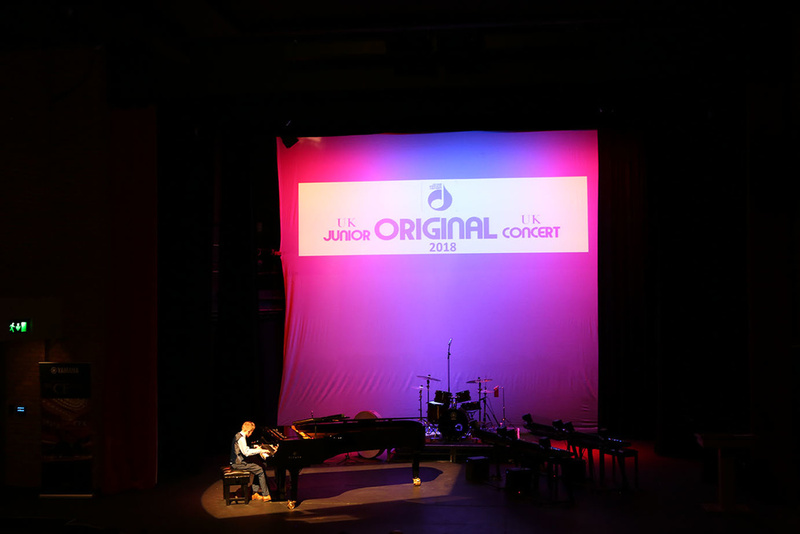 The young performers all impressed with their skill and musicianship, and the event was an unqualified success from every angle including, according to the organisers and members of the audience, the sound. I thoroughly enjoyed the day, and it was a privilege to work with these exceptional young performers and do my little bit to make sure that the technical side didn’t get in the way of their music-making. And I have to say, the DPA d:vote mics played a major part in achieving this result. It wasn’t so much a case of ‘those piano mics sound really good’, but more ‘the piano sounds really good’, and I believe that’s about as complete a summary of their performance as I can give. Listening back afterwards to the recorded tracks was a pleasant experience, and the only thing we needed to do was balance the room ambience between the internal (and therefore fairly dry) piano sound from the 4099s with the rest of the overall sound. The d:vote mics were incredibly easy to set up, produced an uncoloured, always manageable sound, and are probably the ultimate in discreet stage visuals. With a pair of these in my mic chest, I am confident of taking on the might of the world’s most upmarket, expensive grand pianos. Bring ‘em on!